Aging can be caused by both intrinsic and extrinsic factors. As we age, our bodies produce free radicals which become catalysts of premature aging. The problem gets impregnated with external factors like UV rays, infrared radiation, pollution and some lifestyle factors too. The skin due to this continuous process loses firmness, radiance, laxity and experiences pigmentation. Though one cannot stop this process it can be slowed down with the right approach at the right time. Argireline:It is a substrate of botulinum which is known for obstructing muscle movement. This obstruction is responsible for muscle contraction which averts wrinkles from forming. It has been proved that 10% conc. of Argireline results in 30% reduction in wrinkles in 30 days. DMAE: It helps in lightening up of forehead lines, periorbital fine wrinkles and makes skin look smooth and supple. Numerous evidence stands for supporting the effect of 3% DMAE gel in correcting sagging skin. Edelweiss extract: The natural metabolites in it lend protection against ultraviolet radiation. 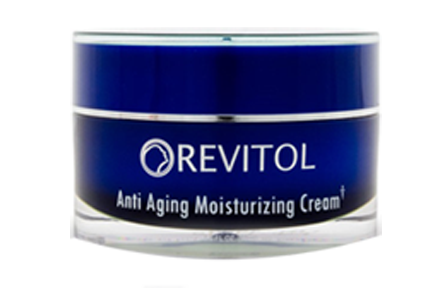 The antioxidants in Revitol anti aging cream fight free radicals. It provides moisturization to the skin and boosts cell regeneration thus making it more elastic and youthful. Hyaluronic acid: Though it is present naturally in all mammals, with age, it starts reducing. As one of the Revitol anti aging cream ingredients, it performs the same functions as the natural hyaluronic acid. It hydrates, encourages collagen production, performs the role of an antioxidant, maintains elasticity and also behaves like an anti-inflammatory and anti-bacterial agent. Pentacare NA: It is a paraben free ingredient and a safe substitute of serum albumen earlier extracted from cow’s blood. This one is extracted from seeds of locust bean gum and hydrolyzed proteins from wheat gluten. As one of the Revitol anti aging cream ingredients, it tightens skin effectively.